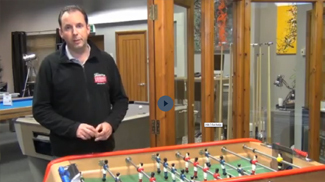 The best range of glass top football tables and foosball for home or commercial use. All at lowest prices and come with free delivery! Our range of glass top foosball tables and table football games come in a variety of different colours and finishes to match any interior or requirement. All of these football tables have a glass top that will provide protection against the elements, keep unwanted objects out of the playing area, and provide security for your table in a public setting. A glass-topped football table can be an aesthetic or a practical choice. Glass can be much more easily cleaned than the playing surface, so it's much easier to ensure that your table looks good all the time. All of our glass top tables are delivered to your home free of charge, and come with the accessories you need for a great game of foosball.